As a toddler I was paid in cookies for modeling with the product. At age nine I worked in the shipping department pasting labels on crates and made $25 for a summer. 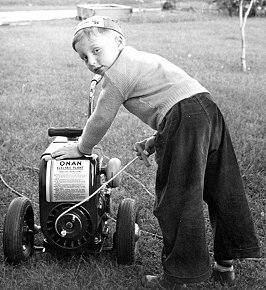 Dad, Bud Onan, let me come to the shop after school whenever I wanted, and then go home with him at the end of the day. So, we talked a lot about what was going on. About the time I was a junior in high school I started working summers as a draftsman. I enjoyed being at a big drafting table. It was fun learning from the other draftsmen, many who produced real works of industrial art. Dad usually spent some part of the day in drafting, working with Al Fleury or Ole Aho on one pet project or another. After a year at the University of Minnesota in Engineering School, I was back working full time. It was a drafting job that turned into a sales job in a mobile product display. A year or so later when this was over, I went back to engineering to work on engine development. Most of my time was spent on the small diesel engines. Improving the old models and then development of the J series diesel. In June, 1962 I presented a paper to the Society of Automotive Engineers in Atlantic City, NJ, on the development of the J series product line. With a couple transition assignments, I began what was called Product Planning or just plain Planning. This involved advertising, sales promotion, market research and product planning. While we liked to think the company was now marketing driven by Roy Mullin, in fact there were a lot of engineering and technical considerations that had to be justified with market considerations. I helped facilitate bringing these interests together. My last effort was giving up my conference table for the planning of the new building in Fridley. I left the company in 1968 with my name on a new office I never occupied. The 15 years I worked at the company were a lifetime of experience. I rubbed shoulders with people who were the best in their field. I was blessed.